The purpose of this document is to capture the experiences Groundwire (formerly ONE/Northwest) gained in running Plone Conference 2006 for the benefit of future Plone community event organizers. Plone Conference 2006 was held October 25-27, 2006 in Seattle, Washington, USA. We had approximately 350 attendees from 35 U.S. states and 20 countries. Over 110 people attended two days of pre-conference training sessions led by Joel Burton, Andy McKay and Richard Amerman. Approximately 50 people attended a two-day post-conference "code and community projects sprint" hosted by the Fred Hutchinson Cancer Research Center. Plone Conference 2006 was organized by Jon Stahl and Andrew Burkhalter of Groundwire (formerly ONE/Northwest), with lots of help from lots of people, whom we thank at the end of this document. This document was written by Jon Stahl, with input and advice from Andrew Burkhalter, Sean Pender, Joel Burton, Paul Everitt and Alexander Limi. Getting an early start on conference planning is absolutely essential to having a successful conference. Conversely, one of the biggest mistakes you can make is to start late. We recommend starting the conference planning process six months in advance. Following is a rough timeline of key events in the Plone Conference 2006 planning process, in reverse chronological order. Seattle wasn't a "strategic" location choice for Plone Conference 2006 -- it's where ONE/Northwest, the conference host organization, happens to be based. We didn't have the resources or expertise to organize a conference long distance, so it was easy for us to choose Seattle. This was the first Plone conference or symposium in the western U.S., and was able to draw in many attendees from the strong and growing Plone community along the west coast. Seattle is reasonably inexpensive compared with larger U.S. cities such as New York, Washington D.C., and San Francisco, and most European cities. The Northwest U.S. and British Columbia have very strong communities of Plone users, many in larger organizations, and Plone Conference 2006 was able to reach a good number of these folks as first-time conference attendees. Before submitting an official bid, we conducted an online survey of the Plone community in May 2006 to gather the community's accumulated wisdom from past Plone conferences, and to get a sense of what the community wanted, expected and needed from Plone Conference 2006. It helped us a great deal, and gave us a pretty clear idea of what would make the conference a success. We held the main events of Plone Conference 2006 at the Seattle Center's Northwest Rooms, a small conference facility on the grounds of Seattle Center, which is a complex of theater, recreation and multi-use buildings owned and operated by the city of Seattle. It offered an affordable, low-key venue located in the heart of a very walkable area of Seattle with lots of nearby lodging, food and entertainment options. We also considered hosting the conference at the University of Washington, but no suitable spaces were available during the time windows we were considering. We didn't want to host the conference in a large downtown hotel, fearing that it would be too expensive. More importantly, we feared that a "posh" location would make it harder to create a conference with a informal, grassroots, community-driven feel. 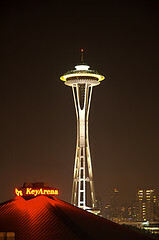 The staff of the Seattle Center was outstandingly helpful and friendly. One of the advantages of Seattle Center is its proximity to a wide range of inexpensive food options, meaning that we could avoid having to provide full meal services. We opted to provide continental breakfast items and a mid-afternoon snack each day, in addition to beverages throughout the day. Seattle Center has a list of approved caterers. We requested bids from a number of caterers, and chose to work with Joanie's Catering, who did an excellent job all around. The Plone Foundation played a critical role in making Plone Conference 2006 happen. For ONE/Northwest, the biggest initial barrier to tackling Plone Conference 2006 was the fact that we couldn't afford to advance the project the $8000 we thought we'd need to spend before sponsorship and registration dollars started rolling in. Fortunately, the Plone Foundation was able and willing to advance ONE/Northwest $8000 to cover up-front conference costs. We signed a promissory note with the Foundation, and repaid the $8000 in full shortly after the conference closed. The willingness of the Foundation to provide seed capital made the difference between ONE/Northwest being able to host the conference and having to say "thanks, but no thanks." So, thank you, Plone Foundation. We couldn't have done this without you. 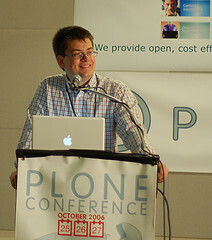 Total expenses for Plone Conference 2006 were approximately USD$63,000. Total income was approximately USD$99,000. The conference earned a profit of about USD$36,000 -- and required over 350 hours of staff time to organize. This allowed ONE/Northwest to treat Plone Conference like a standard consulting project. We feel that we were fairly compensated for the time we invested in organizing a successful conference, but also happy that didn't make a windfall profit -- exploiting the user community wouldn't be the "open-source" way. ;-) Therefore, we think the Plone Conference is a financially sustainable event. A significant portion of Plone Conference 2006 revenue came from sponsors -- approximately USD$24,000. Sponsorship tiers are documented here. We developed these tiers primarily by incrementally adjusting the tiers and benefits from past Plone Conferences. Most sponsors were already "true believers" in Plone. Because our budget projections showed that we could have a very successful conference simply by matching the sponsorship levels of previous conferences, we didn't put a great deal of effort into developing a more elaborate sponsorship package or doing extensive outreach to new prospective sponsors. We believe that more should be done in the future to enhance the value proposition of Plone Conference sponsorship. Feedback from 2006 sponsors indicated that we did a good job of developing an attractive "Platinum" package, but an insufficiently clear distinction between Gold/Silver and Silver/Bronze sponsorship levels. One specific incentive we could have offered Gold + Platinum sponsors, had we thought of it in time, was contact information for all registrants. We didn't do this because we didn't think of it in time to put in place a clear permission system for registrants. This is discussed further in the registration section below. In our conference planning survey of the Plone Community, we established that a price range of $250-300 was attractive to nearly all survey respondents. One of our goals for the conference was to draw in first-time conference attendees. We felt that our best chance of accomplishing that goal would be to price the conference as low as possible, and to avoid charging extra for tutorial sessions. Several folks asked why we didn't offer student, non-profit or other discounts. The main reason was that we had already decided to have a low price for the conference. More importantly, we wanted to keep the registration process as simple as possible, and avoid the administrative hassle of having to "qualify" people for discounts. This also helped make revenue more predictable and easier to forecast -- an important consideration for a first-time conference organizer. Several folks, mostly from the Seattle area, inquired as to whether they could register for a single day of the conference. We didn't have a published one-day rate, but we did allow a few one-day registrations at a rate of $100. We didn't actively enforce this, trusting that the Plone community is comprised of honorable folks who weren't out to rip us off. ;-) We think it would be a good idea for future conferences to offer a one-day registration rate, and to make sure that the name badges clearly indicate one-day attendees. We didn't have a scholarship program, apart from our speaker payment plan. (See below for details). A scholarship fund would be a good idea for future conferences, since some key Plone contributors can't afford extensive business travel. A scholarship program, administered by the Plone Foundation, would also be an excellent, inexpensive and community-building way to recognize significant contributions to the community. With three past Plone Conferences, the basic outline of a Plone Conference program was pretty clear: short talks, longer tutorials, a keynote or two, lightning talks and birds-of-a-feather sessions. All in all, a fairly traditional structure. As new conference organizers, we were loath to mess with the formula too much. However, there were a few new wrinkles we wanted to test out. Our most important goal for Plone Conference 2006 was to make it an inspiring, empowering teaching and learning event for beginning and intermediate Plone users, administrators and developers. We wanted to showcase the richness and diversity of the Plone community, and the many exciting projects that are putting Plone through its paces and pushing it to the leading edge of content management systems. Specific aspects of that richness and diversity we wanted to highlight included the many different sector that are using Plone, including businesses, nonprofits, educational institutions, governments, and scientific organizations. We also wanted to draw in folks from diverse geographies. We wanted to build and strengthen the person-to-person connections that are the lifeblood of a vibrant open-source community. We wanted a conference that was relaxed, fun, grassroots and authentic -- like the Plone community itself. We knew we needed to have Plone community's best teachers and trainers covering "Plone's greatest hits" -- the evergreen topics that every Plone user needs to know. We knew that we needed to offer sessions addressing the many new technologies that landed in Plone 2.5 and will be used extensively in Plone 3.0 and beyond. We wanted to cover some of the "soft" (i.e. less technical) issues surrounding the real-world implementation of Plone projects. We wanted sessions that would help build community and drive forward the long-term Plone development process. Thanks to suggestions from several Plone community members, including Munwar Shariff of Cignex, we thought that "case study panels" showcasing Plone projects in a variety of different sectors (enterprise, nonprofits, education, science, government) would be a big draw. Getting the program together was one of the most labor-intensive parts of the conference. Past Plone Conference agendas were the result of community members submitting talk proposals. We believed that in order to create an agenda that would achieve these ambitious goals, we'd have to have a process that was a bit more designed. At the same time, we wanted a process that would continue to be open to participation and thus to innovation and the unexpected. After considerable discussion amongst ourselves and with key leaders in the Plone Community, including Alan Runyan, Paul Everitt, Alexander Limi and Joel Burton, we decided that we would invite specific talk and tutorial sessions that we felt were "must haves" and then open a call-for-proposals process, but seed that process with some suggestions for talks that we'd like to see. We started by brainstorming a big "wish list" of sessions. For some sessions we identified our "dream" speaker. E.g. we knew we wanted Geoff Davis or Joel Burton to talk about caching and performance tuning. With our wish list of sessions in hand, we approached about a dozen folks with specific session ideas. Almost all agreed immediately, or suggested another idea that was near the top of our wish list. From these folks, we also got some great ideas about who to invite for sessions we knew we wanted, but for which couldn't identify speakers. In less than two weeks, we had about a dozen sessions lined up, enough to feel that we had a solid core for our agenda-in-progress. We had about 3 invited tutorials, 4 invited talks, and the case study panels were also invited. This allowed us to begin aggressively marketing the conference with specific, marquee-worthy sessions from well-known presenters even before we had a complete agenda. We believe this led very directly to a sold-out conference. On we moved to the call for proposals process. This was one of the trickiest bits of the whole process. It had to be (and be perceived as) open and fair. It also had to move fast. Finally, we wanted to ensure that all our accepted sessions not only covered interesting and important topics, but would be well delivered by good speakers. We decided to put out a fairly directed call for proposals that explicitly laid out our evaluation criteria and provided some very specific suggestions for talks and tutorials that we wanted to see at Plone Conference 2006. We also announced our speaker compensation plan. Joel Burton, who has strong relationships with many leading Plone developers, was invaluable in recruiting strong proposals via direct contact. Future conference organizers would be well advised to recruit him, or other core Plone community members, to "gently remind" people to get talk proposals in on time. We knew that a successful Plone Conference would have to draw in presenters from around the world, many of whom are volunteers. We felt that we needed a compensation structure that would allow us to partially subsidize them. Given our goal of making Plone Conference 2006 an outstanding teaching and learning experience, we wanted tutorial leaders in particular to have a clear incentive (and expectation!) to spend the time necessary to prepare a high quality long-format tutorial session, with demonstrations and supporting materials. We introduced a new "panel session" format, and we wanted to give folks a financial incentive to consider organizing one. We decided to create a "Program Committee" consisting of experienced Plone community members as well as less-experienced-but-trusted peers from the local Plone community. The Program Committee's task would be to review and rate talk proposals. Final decisions on which talks to accept were made by Jon and Andrew. But we gave a huge amount of weight to the committee's aggregated scoring of the proposals, in most cases trusting their combined wisdom over our own preferences. With a three-week window for submitting proposals, we received approximately 70 complete proposals. (Link to proposal submission survey.) We were amazed by both the quantity and quality of the proposals that came in. With 70+ proposals, we needed to keep the evaluation process lightweight, quick and quantitative. We arranged the materials into a simple survey (again with the surveys!) and asked each member of the Program Committee to rate the proposal quality and the presenter quality (scale of 1-5) and to offer any comments. We gave the Program Committee about a week to get their evaluations in. With a few reminders, they did so. ;-) Using an online survey tool made it easy to quickly compile and analyze the results. We now had a short list of invited sessions, a long, ranked list of proposed sessions, five rooms and three days. It was finally time for the really hard part -- constructing the actual day-by-day agenda. This process was more art than science. We considered a number of factors, and tried to design a schedule that had a good mix of sessions for different ability levels, avoided pitting "superstar" presenters against each other, fit the available rooms, and got as many of the highest ranked sessions as possible into the agenda. Although there were definitely some tradeoffs, given the increasing size and diversity of the Plone community, we feel that aiming for 3-5 parallel sessions rather than 2 is a wise move for future conference organizers. We did wait-list four sessions in case a scheduled presenter canceled. To our surprise, none did, and we did not wind up accepting any talks off of the waitlist. We did encourage all the folks with unsuccessful proposals to consider presenting a lightning talk or convening a "birds of a feather" session, and several did. We composed a draft of the day-by-day schedule in an Excel file, and circulated it to the speakers for comments. A few people made very small suggestions. After a few minor revisions, we called it final and published it the website. Constructing the final agenda required several days of very intense work. Jon did most of the work, but it was extremely helpful to have another person (Andrew) who knew all of the sessions and presenters close at hand to help resolve difficult questions around pacing and sequencing. The pre-conference training sessions were one of the biggest reasons for Plone Conference 2006's success. Future conference organizers would do well to include them. It all started innocently enough. Joel Burton, one of our key advisers, and a Plone trainer, said, "Hey, if you want, I'd be willing to do a small training class the couple of days before the conference. 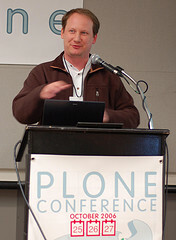 It might be good marketing for Plone (and me!)." By the time it was all over, we'd had three pre-conference training classes with over 120 students, and an informal survey showed that 80% of them had come to the conference specifically for the training classes! Clearly, one of the keys to a successful conference is offering high quality, low-cost training classes. We hadn't originally intended to do pre-conference training classes. But when Joel suggested the idea, it immediately seemed like a good one. And it just so happened that our venue featured three classroom-sized spaces that would easily handle 40-100 people each. A quick call to Seattle Center and we had those spaces for the two days prior to the conference. We felt that offering three classes -- one each for beginners, intermediate and advanced Plone developers -- would give us the best marketing draw. A few phone calls later, we had Joel, Andy McKay and Richard Amerman all lined up and ready to go. Descriptions and information are archived at http://plone.org/events/conferences/seattle-2006/training-classes. In order to keep the registration process as simple as possible for us, and to avoid the financial risk of classes, we agreed with the trainers that the training classes would be financially independent of the conference itself. We contracted for the space, and Joel made a single payment to us to cover that. After that, each trainer registered their own students, completely separate from conference registration. This caused some confusion for some registrants, but it was manageable. Most interestingly, Joel asked his students to raise their hands if they had come to the conference because of the trainings. The vast majority raised their hands. In our post-conference evaluation survey, 8% of respondents said that it was a make-or-break factor in their decision to come, and another 26% said it was a strong influence on their decision to attend. 34% of conference attendees is over 100 folks. Eben Moglen's keynote talk was one of those amazing gifts that was dropped in our collective lap. We hadn't originally planned to have any "outside" keynoters -- not that we were opposed to them, but we didn't have any money in the budget to pay a speaker's fee, and Andrew and Jon didn't have any strong connections to an interesting, relevant person. We had pretty much settled on having Alan and Alex do their traditional "State of Plone" plus Alex's "Plone 3.0 Sneak Peek" talk. But then along came Jonah. Jonah Bossewitch. Bless his heart. He called us up one day and said, "Hey have you got a keynoter yet? No? Well, would you be interested in Eben Moglen? Good, because I talked to him last week and he said he'd do it. He probably just needs an invite letter from the Plone Foundation to seal the deal." How could we turn that down? ;-) So, a letter was written, and a couple of weeks later we got an email from Eben's assistant, Ian Sullivan to confirm times and dates. Eben proceeded to knock everyone's socks off. Sometimes you just can't plan the good stuff. Thanks to Jonah, Ian, and Paul Everitt for making it happen. And to Eben, for all he has done to advance, defend, promote and inspire the free world. Use a simple online survey tool to collect session proposals and evaluations. We were familiar with SurveyMonkey.com, and its simplicity, speed and flexibility were great. Have at least 3 tracks with sessions suitable for everyone from newbies to core developers. Tracks were based on skill level, loosely defined, with content relevant to all sectors in each track. Focus strongly on sector-specific users -- education and government folks turned out especially strongly. End the day with Lightning Talks and BOF sessions. Also make it easy for folks to organize lunch and dinner BOFs. Provide 5-10 minute breaks between each sessions, with at least one 30-minute break in the mid-morning and mid-afternoon. Allow 90 minutes for lunch. We might do away with the three-hour tutorial format -- it's very long for the students, and difficult to prepare for the presenters, unless they already have a detailed curriculum in the bag. 90 minutes is long enough to provide a good workshop on most key technologies. We would have more "workshop" sessions such as Martin's session on "solving the third-party products" session. These less-technical sessions require a strong facilitator, but can be vitally important for moving our collective work ahead, and letting a broader section of the community participate in planning and visioning. We might handle pre-conference training session registration next time, in order to reduce confusion for registrants. Among the trainers, Joel found it preferable to handle his own registration (and he also handle registration for Andy's class). Whether to do flat-rate contracts with the trainers is an interesting question that we're undecided on. Put longer sessions in the morning and create a fast-paced afternoon to stave off post-lunch drowsiness. We do have evaluation results for each individual session -- these are not publicly available, but we are happy to share them with future conference organizers. We tried to get presenters to submit talk materials in advance. With a few exceptions, it didn't really work. People do a lot of last-minute prep work -- that's how it is in a grassroots open-source community. Future organizers might consider offering a small financial reward (~$100) for getting presentation materials in advance. We did a very thorough job of getting the word out in the existing Plone community, and to some extent in the US nonprofit technology sector. That turned out to be enough to sell out the conference at 350 people. But it is clear that there is a lot more room to do more outreach to the technology sector, educational technologists and government-sector technologists. Future conference organizers should consider convening a PR committee with expertise in doing technology-sector marketing. I'm pleased to officially announce and invite you to join us for Plone Conference 2006, the fourth annual worldwide conference of folks using, developing or just-plain-interested-in-learning-more-about Plone*. Plone Conference 2006 will be held October 25-27 in beautiful Seattle, Washington, USA, at the Seattle Center's Northwest Rooms, and will feature three full days of talks, tutorials and workshop sessions featuring Plone users, integrators and developers from around the world and just across town. We're focusing on developing sessions for folks who are new to Plone, thinking about using Plone for a project, or are delivering Plone-powered projects to clients. So, if you’re not already a Plone expert, that’s not a problem. In fact, you’re exactly who we’re designing the Plone Confernece for! The cost? you ask. A mere $250 -- if you register by August 25th. (After that, $300). And the conference is just the beginning -- or more accurately, the middle -- of a full week of Plone community fun! Just before the conference, there will be three different two-day Plone training classes, and the two days following the conference will feature a weekend-long "code and community projects sprint" which will bring together Plone developers and community members for an intensive weekend of small-group coding and project work. On behalf of all of the folks in the Plone community who are working hard to bring you a fun, exciting and educational conference, I'm looking forward to seeing lots of you in Seattle. Handling the mechanics of registration is an obviously critical part of the conference business process. It is also a process rife with potential for missteps. One of the best and clearest pieces of advice we received from past Plone community event organizers was to not write any custom registration software (not that we were tempted) and to keep the registration process as simple as possible. Good advice, indeed. We didn't have time to conduct a comprehensive evaluation of the many online conference registration vendors. Nor did we want to spend a lot of money on an high-end event registration service for a relatively small and simple event. We were fortunate to know the folks at Brown Paper Tickets, a small online ticketing and event registration company located here in Seattle. They offered a very low-priced and well-supported event registration tool, and most importantly, we knew they would be accessible and accountable to us, and would help us resolve any (inevitable) confusion or mistakes. We knew that we were trading off a bit of flexibility and some advanced configuration options, but we thought the tradeoffs were reasonable. Ability for people to register multiple people, with the ability to capture complete contact information for each registrant. Ability for people to register on behalf of others, with the ability to capture complete contact information for each registrant. Multiple pricing tiers, including time-sensitive pricing and password-protected discount codes. The ability to handle optional add-ons like pre-conference training classes, etc. etc. Note: Brown Paper Tickets has already addressed or is in the process of addressing most of these issues. The ability to accept a mailed-in check or wire transfer payment instead of credit card. One thing we really wished we'd done is put in place a clear notification in the registration process that registrants' contact information would be shared, at a minimum with sponsors as a sponsorship benefit, or perhaps even more broadly with all attendees. In the future, we'd recommend that the registration process include a notification that contact info will be shared (and with whom), with a checkbox to opt-out. Future USA-based conference hosts should be aware that visitors from non-EU (and a few other) countries may need to receive a letter from you in order to facilitate the process of getting a US visitor's visa. We put information about this on the conference logistics page. The letters we sent (via post, fax and/or emailed PDF) were on our organizational letterhead and simply stated something to the effect of "We are delighted to confirm your registration for Plone Conference 2006, to be held in Seattle, WA on October 25-27, 2006. Plone Conference 2006 is the annual gathering of the users and developers of Plone, a popular open-source content management system." For us, this was one of the more intimidating areas of planning the conference. With a tight budget, we didn't have the funds for lavish social events, nor did we feel that big parties were appropriate for the grassroots Plone community. More challengingly, the neighborhoods near the Seattle Center don't have that many venues that can accommodate 350 people. With limited time, limited money and unclear expectations, we decided to do a minimalist social agenda. We made dinners "on your own" which worked due to the highly walkable urban neighborhood near our venue, and people socialized (and pub-crawled) in smallish packs with only a bit of general direction. We sent folks out towards different neighborhoods each night. We avoided trying to arrange transportation for 350 people. We did manage to get large numbers of people to navigate Seattle's (excellent) bus system on Friday night. Having an open attendees email list and a wiki helped folks coordinate impromptu events. In the future, we would suggest trying to arrange at least one structured evening event, perhaps a low-key catered dinner at the conference venue. Such an event would provide an ideal opportunity for community awards and recognition. One of the biggest cautions we got from past Plone event organizers was "make sure the wireless internet works." Easier said than done. A more serious problem was the fact that, despite our explicit instructions to have a network that could accommodate 350 users, their router only provided a class C subnet (~254 users). This became a problem on the first full day of the conference when we saturated the DHCP server and some folks couldn't get on. The problem was rectified by mid-morning of the second day, and after that things proceeded smoothly. Don't try to do wireless yourself -- it's a pain. And you will go crazy when something goes wrong. Pay someone who can and will be accountable to you. And has the resources to fix things when they malfunction. Assume that every attendee will want to connect at once. The providers will not believe you. Insist. Get as much bandwidth as you can. We seemed to be able to congest 3Mbps pretty quickly. Run the wireless network wide open -- no encryption, no MAC address verification. You don't want to have to manage these issues, especially for Linux users. Be sure that there are no ports being blocked upstream -- at a technical conference, people need to do more than just surf the web and download email. They need to SVN, IRC, SSH and more. Be sure you have a direct phone number to the upstream network administrators. You will need it. 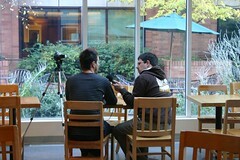 Plone Conference 2006 was the first one to be professionally videotaped. We hired Grace Stahre/Versant Media, a close friend, to tape two rooms for three days. This allowed us to capture most of the key tutorial sessions. Why didn't you videotape everything? Several reasons. Doing 2 rooms for 3 days, with post-production, cost US$15,000. That was about the most we could afford. Grace was leery of trying to coordinate more than two crews. And we wanted to give folks a reason to come! Why did you tape the sessions you taped? We wanted to capture the key tutorial sessions that would have enduring value as teaching references. 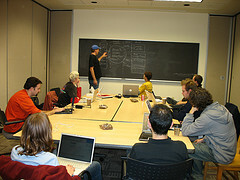 Our second priority was to capture sessions that would help market Plone to new users. Yes, but given the rate of evolution in the online video world, anything we have to say is probably obsolete already. Don't crawl up the learning curve of codecs and formats yourself if you can avoid it. Special thanks to Mr. Topf! This is perhaps a suitable spot to recognize the amazing volunteer videography of Christian "Mr. Topf" Scholz. Christian's a Plone (and Second Life!) consultant. He and his video equipment are a regular feature of Plone community events, and provide invaluable coverage of key talks, interviews and general Plone community culture. 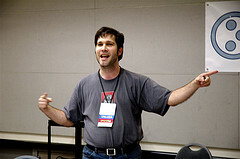 At Plone Conference 2006, he recorded several sessions that couldn't be covered by the professional videographers, including many lightning talks, interviews with key Plone community members, and more. In addition, he provided some live streaming video feeds into Second Life! When we had a significant announcement, we also created Plone.org News Item so it would appear in the Plone RSS feeds. Joel Burton also kindly created an editable conference banner section for the front page of Plone.org which we could update as new announcements became available. We also widely announced Plone Conference news in various lists of the U.S. nonprofit technology community (where we spend our days). This was as much outreach for Plone in general as anything. Technologists in government, especially city and state agency employees. After the conference, we closed the list again back to announce-only, and used it to distribute follow-up information, evaluation surveys, etc. A place to collaboratively take session notes -- this wound up not getting used much. Why did we use a wiki? Isn't Plone a CMS? MediaWiki can allow users to edit without requiring any registration. This was huge -- we believed that requiring attendees to register on Plone.org would have been a psychological barrier to quick and easy participation. Speed of editing -- editing a wiki is lightning fast -- Plone 2.1 isn't. For conference documents, which were going to require many, many tiny edits, this made a huge difference. We fully expect that by the time Plone Conference 2007 rolls around, Plone.org will have a wiki tool enabled (presumably the OpenPlans toolset). the boston plone users group has set up a blog at http://bostonplone.org/blog and we (me, Sid and Michael), will be posting our articles there. There was considerable demand for extra shirts -- print at least 10% more than the total number of attendees. We did (yet another) survey of registrants to get a decent sample of t-shirt sizes. With 150 respondents, we wound up in pretty good shape overall. We'd recommend that in the future, the registration process include t-shirt size, so that ordering can be even more exact. On Alma's advice we did real silk-screening rather than cheaper, digital-print-on-demand. Alma and Alan lugged t-shirts all the way from Houston, TX. This was something of a pain -- in the future, it would probably be best to identify a local t-shirt shop. Cost was $1800 for design, and about $9.40 in production costs per shirt. We had a relatively minimalist set of print materials for the conference, in part to keep things inexpensive, but also because we were making some changes right up to the wire. Be sure to print up extra blank nametags to cover errors. We had a lot more nametag mistakes than we expected! We printed up large vinyl banners with the conference logo and the general Plone logo. One of each for each room. We used these partially as backdrops for videotaping, but also to "brand" the space. Platinum sponsor CIGNEX was allowed to hang a banner in each room, too. We donated the generic Plone banners to the Plone Foundation for use in future Plone outreach. The conference banners were gifted to key volunteers as mementos. It's essential to have a good, bright LCD projector for each room -- at least 2000 lumens (preferably 2500 or more). Have at least one spare too. An ideal venue will have LOTS of electrical outlets in the floor. If it doesn't (and Seattle Center didn't), you will want to buy LOTS of extension cords, power strips and high-quality gaffer's tape (not duct tape!) to tape it all down. This will take several hours, and you'll need a crew of volunteers. We suggest using screens no smaller than 10'x10'. We had some 8x8 and 6x6 screens that were a little too small in some rooms. Recruit trusted volunteers. Six is a good number. Nametags are precious. Alphabetize them in advance, and keep them close. You are lost without them. Have one master hard copy of the registration spreadsheet -- check off all people against it. Have digital copies available. Check in pre-conference training attendees at the end of the second/last day of training, the night before the conference starts. This sliced a third off of our first-morning registration workload. Don't hand out t-shirts on the first day -- it slows things down too much. Hand them out starting on the second day. It's OK that people have to come by the table twice. Give conference volunteers their t-shirts on the first day so they stand out and feel special. Good beginnings are really important. Conferences can be socially awkward. Your most important job as the conference organizer is to create an instant sense of community that makes people feel passionate and inspired. (Easy job, eh?) Reserve the first 45 minutes of the first day for an ice-breaker session. Welcome people, acknowledge everyone who's gotten you this far, and then get people talking to each other. If you're not comfortable emceeing something like this, recruit Paul Everitt to help you out. He's well known, low-key, self-deprecating and a heck of a nice guy. And he's not paying me to write this. Really. Print out simple signs, one per day per room, with the day's sessions for that room. Put them all up on the first day, tear one down each night. This prevents people from being in the wrong place at the wrong time. We hadn't initially planned to host a post-conference sprint, but once again, the Plone community stepped up to the plate and made it happen. We just provided a tiny bit of facilitation and coordination. For Seattle Sprint 2006, the facility was provided by the Fred Hutchinson Cancer Research Center, who are enthusiastic uses of Plone (and Python!) and regularly host Seattle Python gatherings. FHCRC staffer Dirk Petersen was our lead contact who arranged for our use of the venue, was an indispensable liason and a graceful host. In addition, Chris Calloway and the TriZPUG users group stepped up with $500 worth of sponsorship, which helped offset the costs of FHCRC security and staffing their coffee bar. (A caffeinated sprinter is a happy sprinter!) JG Perpich LLC made an impromptu decision to sponsor pizza for the sprinters, too! The Seattle Sprint was structured like a mini Snow Sprint, i.e. it drew heavily from the principles of "open space" -- all are welcome, work teams were semi-self-organizing, and there was a strong focus on teaching and learning, rather than flat-out code productivity. See my blog post "Sprint Wisdom" and the links in the comments for more background on code sprints if you're interested. It is essential to lock down the sprint dates and facility early, so that it can be announced as people are making their travel plans! We announced the sprint as part of the overall conference outreach, but created a separate "Sprint Wiki" space on openplans.org so that folks from the community could easily step up and organize it in a decentralized manner. The strategic purpose of a post-conference sprint is to draw new folks more tightly into the Plone community and to make them feel empowered as contributors. Do spend some effort recruiting experience Plone community members to lead sprint teams. Nate and Rocky helped with this, as did Sean Gilles (Geospatial), Rob Miller (membrane/remember), Jean-Paul Ladage, and others. 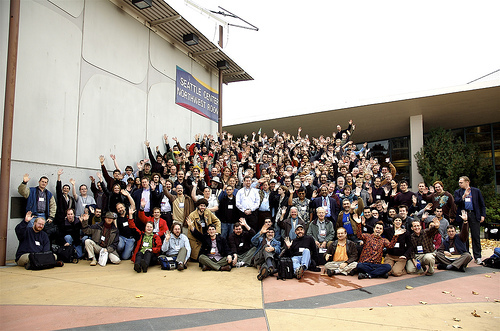 There is a long list of people who played roles large and small in making Plone Conference 2006 a success. First and foremost, the Plone community at large. You showed up. You were present. You taught and learned, laughed and shared, ate and drank. The Plone community is the beating heart of Plone, and the conference was as much a celebration of that community as everything else. Alan Runyan, Alexander Limi, Paul Everitt and Joel Burton were hugely valuable advisers about a tremendous range of both strategic and tactical issues. Future conference organizers would do well to tap their combined wisdom. Our colleagues at NPower Seattle, Jesse Snyder and Ann Jensen, provided amazing logistical support during the busy week of the conference. Jesse also helped out with the Program Committee. Alma Ong of Clearnoodle.com did logo, t-shirt and brochure design, and (repeatedly) pulled our bacon out of the fire as time grew short in the days before the conference. Many members of the local Seattle Plone community (and beyond!) pitched with loans of projectors, extension cords and other miscellaneous gear. Among them: Josh Livni, NPower Seattle, Chris Davis, Jessemine Fung, Brian Gershon, Ned Schumann, Joel Burton, Andy McKay. The entire crew here at ONE/Northwest rallied around this project in ways large and small. Andrew Burkhalter was my alter ego throughout. Sean Pender kept all of the money flowing. Sam Knox helped with a thousand logistical details. Kelley, Dave, JonB, Drew, Steve, Gideon, Jim, Tiffany, Jodie and Mike are an amazing team of people to work with.